I had the pleasure of photographing Rachel and Phil's wedding yesterday at the recently refurbished Whitstable Castle. I first had to drive to Rachel's family home, Folly House, for a few group shots and just as I arrived the snow blizzard started. During the hour I was there we must have had 3 inches of snow. I struggled to find the driveway back out of the house so apologies to Rachel's father if his beautiful lawn now has tyre tracks across it! I arrived safely at Whitstable Castle (alas, quite a few of the guests were unable to make it), plugged my Speedlite into my CP-E4 battery pack and started shooting. Fortunately the snow stopped during the ceremony and everybody was brave enough to go outside for the group shots - such fortitude! Phil's father, Tony, then served as my lighting assistant and we had fun with some off-camera flash (as in the shot above). The journey home didn't go quite as smoothly. It took 2.5 hrs, as opposed to the usual 40 minutes, due to a jack-knifed lorry on the Thanet Way but no overnight stay in the car was required. I had my blankets and thermos in the boot just in case though! I've finished processing their photos - please check out their wedding gallery on my website or on Facebook (doesn't require Flash compatibility and the photos are bigger). 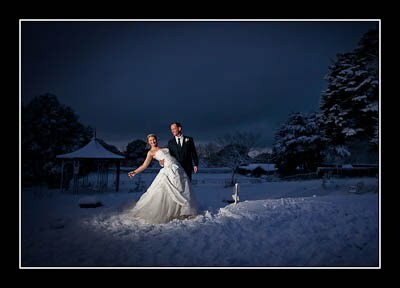 Wow, looks like some lovely snowy wedding photographs from the sample. Great job.